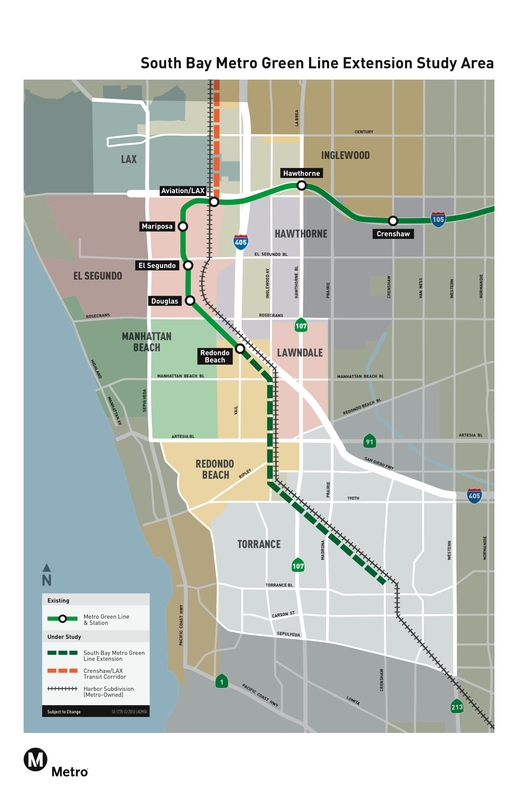 An extension of the Green Line from its current terminus in Redondo Beach to the Torrance Transit Center is currently being studied by Metro. The project is in its draft environmental study phase and a new round of meetings begins soon to give the public a chance to catch up on the relevant issues. The press release is after the jump — the meetings are between April 26 and May 5. The draft environmental report is considering whether it’s best to upgrade traffic management systems in the area, extend the light rail line or not build anything (an alternative that the law requires to be studied). When the report is complete, Metro staff will make a recommendation which of the above is best and ultimately the agency’s Board of Directors will select what to do. A Green Line extension would be funded in part by the Measure R sales tax. Metro will hold four public scoping meetings beginning Monday April 26 for the South Bay Metro Green Line Extension project. These scoping meetings are the first step in the environmental process and Metro is seeking public comments and input for extending rail service farther into the South Bay to improve mobility in southwest Los Angeles County. Metro is currently preparing a Draft Environmental Impact Statement/Environmental Impact Report (DEIS/DEIR) to identify transit improvements that would provide an alternative to the I-405 corridor by accessing the regional rail network through connections to the Metro Blue Line and the proposed Crenshaw/LAX Transit Corridor, currently under environmental review. The freight track alternative will evaluate operating rail transit vehicles on the Harbor Subdivision right-of-way using upgraded rail tracks from the El Segundo/LAX area to the proposed Torrance RTC. In addition the Draft EIS/EIR will evaluate the No Build and Transportation Systems Management alternatives. • Monday, April 26, 2010 (6-8 p.m.) Nakano Theater, 3330 Civic Center Drive, Torrance. • Wednesday, April 28, 2010 (6-8 p.m.) North Redondo Senior Center, Perry Park, 2308 Rockefeller Lane, Redondo Beach. • Saturday, May 1, 2010 (10 a.m. – 12n) Lawndale City Hall, 14717 Burin Avenue, Lawndale. • Wednesday, May 5, 2010 (6-8 p.m.) Automobile Driving Museum, 610 Lairport Street, El Segundo.